If you have ever watched the movie “War Games,” you might have some idea what could happen if one of the superpowers early-warning defense radar detected an unexpected missile launch. The situation could escalate quickly, and if the offending country didn’t do something to stop the missile, the superpower might have no choice but to launch a counterattack. Of course, all this seems like part of a movie, but on January 25, 1995, it was no movie trailer. 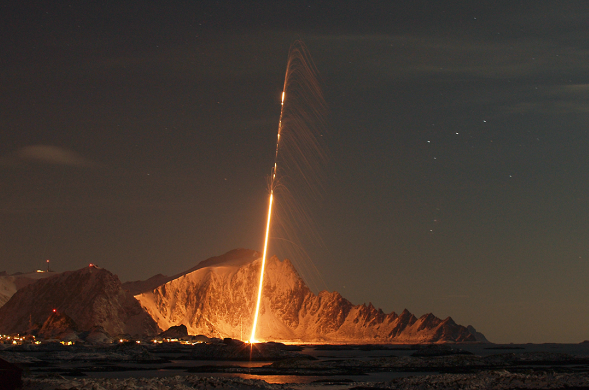 On that day, Russia’s early-warning defense radar detected an unexpected missile launch near Norway. The Russian military command estimated the missile to be only minutes from impact on Moscow. When I think of early-warning system, somehow giving a country’s capital just a few moments warning doesn’t seem like very much warning. Russian President Boris Yeltsin, his defense minister, and his chief of staff were informed of the missile launch. There was no time to lose. They quickly switched the nuclear command systems to combat mode, and the nuclear suitcases carried by Yeltsin and his top commander were activated for the first time in the history of the Soviet-made weapons system. Five minutes after the launch detection, the Russian command determined that the missile’s impact point would actually be outside Russia’s borders. That was good news I’m sure, but they still had a problem. Was Norway was so bold as to launch an attack? Three more minutes passed, and Yeltsin was informed that the launching was likely not part of a surprise nuclear strike by Western nuclear submarines. It was a planned launch that was not hostile. These conclusions came minutes before Yeltsin and his commanders should have ordered a nuclear response based on standard warning protocols. Later, it was revealed that the missile, launched from Spitzbergen, Norway, was actually carrying instruments for scientific measurements. Nine days before, Norway had notified 35 countries, including Russia, of the exact details of the planned launch. The Russian Defense Ministry had received Norway’s announcement, but somehow they had neglected to inform the on-duty personnel at the early-warning center of the imminent launch. The event raised serious concerns about the quality of the former Soviet Union’s nuclear systems. And it proved that it was imperative that anyone informed of a planned scientific launch must tell all those who needed to know.